Go Daddy offers domain name registrations fast, simple, and in affordable cost.So many business owners chose Go Daddy to be their Domain Name registrar, as it provides first class domain and hosting based services. It have support team round the clock, they are ready to help you on any issues whether big or small. Go Daddy allows you to do that and so much more.If you decide to buy any product from Go Daddy , then we have a chance to get discount on every purchase using godaddy promo code. With the help of godaddy coupon code , you can get huge offers on your order. All codes are valid and has no expiry dates. All codes are for new registrations.Not valid for renewals. Favicon means favorites icon, is a 16×16, 32×32 or 64×64 pixel square icon associated with a particular website. It is also known as a shortcut icon, URL icon, website icon, or bookmark icon. Browsers that provide favicon support typically display a page's favicon in the browser's address bar and next to the page's name in a list of bookmarks. It is the great advantage for Web designers to represent their web page in graphical way. Favicon gives unique look for your website and attracts visitors. Upload your file to external hosting to get direct link. Here is one website that provides free hosting Iconj.com. A piece of code will be given there. Now edit HTML and insert code after <head> tag. If you have your own hosting, then change below code line according to your favicon location. For any information, you can leave a comment at the end of post. Do you ever tried to know how many people are visiting your blog, or where they come from? You can track the visitor stats using web tracker sites like Google Analytics, Site Meter, StatCounter. Web stats are useful in optimization of your blog. There are many sites which provide stats on blogs or websites. But I use and recommend statcounter because it is simple, more informative, free service, real-time stats and easy to install. StatCounter is offering both invisible and visible trackers. Register an account in StatCounter. Now you can analyze your stats. Meta tags are important for Search Engine Optimization because Google and other search engines might use them as snippets for your pages. A page description Meta tag gives summary of what the page is about. It might be a sentence or two or a short paragraph. It might help search engines to find content and to matching up with a user's search query. 1. Modify the colored text, according to your blog. 2. 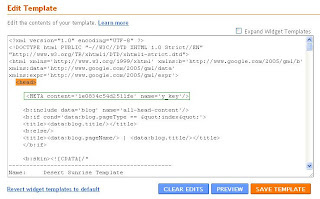 Open Blogger Dashboard in blogger --->> Next click your blog Design option --->> click Edit HTML. 3. Find <head/> tag and Paste Meta Tag just below it. Click Save Template. Don't fill description with only keywords.Search engines will ban your site from their listing. So use distinct,related and informative description. 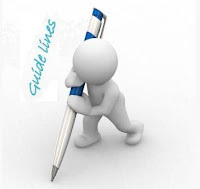 Avoid writing a description Meta tag that has no relation to the content of your blog. Using generic descriptions like "Page about"or "This is a web page" are not recommended. Don't Copy and paste the entire content of the posts into the description Meta tag. Repeating keywords again and again may give negative result.